Victoria Swedish Eggwhite & Lanolin Facial Soap, also known as Agg-Tval, has been used by fair-skinned Swedish women for nearly one hundred years. 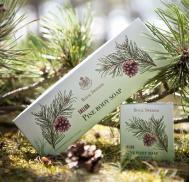 Royal Swedish Tallba Pine Soap is a traditional product designed to cleanse and nurture your skin. The first Tallba soap saw the light of day already in 1935. The design as well as the product has been created with inspiration from the deep, Swedish pine forests. Imagine a warm summer morning when the rays of sunshine are filtering through the branches of the pine trees and a fresh scent of musk, amber, mint, moss and pine fill up your senses. The very famous Swedish Summer Soap, by Victoria Scandinavian Soap Company, floats in fresh and salt water and gives a rich and creamy lather! Good for shaving too! Made in Helsingborg, Sweden. Royal Swedish Spa Soap, Liquorice 100ml by Victoria Scandinavian Soap Company, a gentle cleansing soap with extracts of liquorice root for clean, fresh skin. Made in Sweden. Vegetable based soap, no animal testing! Royal Swedish Birch Leaf Body Wash, refreshing and clean-scented! A beautifully scented, creamy and rich Olive Oil Soap, made in Sweden. Creamy and frothy, as it's name indicates, Royal Swedish Cremosin Soap has been a classic soap in Swedish homes for five generations. Made by Victoria Scandinavian Soap Company. Paraben free. Swedish Summer Shower Gel & Shampoo 250ml, for both hair and body gives a rich and creamy lather in fresh water and in ocean water! Made in Sweden by Victoria Scandinavian Soap Company. Royal Swedish Spa Soap, Pomegranate 100gr by Victoria Scandinavian Soap Company, made with pomegrante seeds and guarana to exfoliate and soften the skin. No artificial colors. Vegetable based soap. Not tested on animals. Made in Sweden.